Walnuts are among the healthiest nuts in the world. After all, they have been shown to boost heart health, promote brain health, and fight depression. But, there is one type of walnut in particular that provides its own health benefits. I’m talking about the black walnut—also called the Juglans nigra in the plant world. The black walnut has been used for hundreds of years, including within Russian, Chinese, and Native American cultures. Today, research shows that these nuts expel parasites, improve heart health, protect against certain cancers, and treat malaria, as well as bacterial and fungal infections. Read on to learn more about black walnut, especially its amazing nutrition facts and health benefits. Black walnut is considered a large hardwood species in the Juglandaceae family that is native to Eastern North America and spreads west to California. It also goes by the name American walnut. This type of walnut tree will grow up to 100 feet and as long as 10 feet. The Juglans nigra tree is native to Kyrgyzstan, Himalayas, and Central Asia. It was also first cultivated in Europe around 100 B.C. These walnuts have a deep history in medicine, while its versatility lends to several other uses. For instance, the hulls are used to make natural plant dye, with shades of light brown, cream, or deep brown. Black walnut wood is heavy, hard, and very attractive, which makes it a popular wood for making cabinets, interior finishing, veneers, and furniture. It was also a popular wood for gunsmiths, especially for long rifles in Pennsylvania. Historically, it was used for ulcers, snake bites, syphilis, toothaches, kidney problems, fevers, and gastrointestinal concerns. The Roman naturalist named Pliny the Elder first discovered the healing power of black walnut back in the first century A.D. Then, in the 17th century, herbalist Nicholas Culpeper first prescribed these walnuts for drawing out poisonous venom from spider and snake bites. Native Americans also used the nuts, husk, bark, and leaves from black walnut as a mosquito repellent, and for treating psychological disorders and skin conditions. They were also the first to use it for parasite elimination and as a natural laxative. What are the important black walnut nutrition facts? Its fruit, bark, and leaves contain an active constituent called juglone (5-hydroxy-1,4-naphthoquinone), which is effective against Helicobacter pylori (H. pylori), tobacco mosaic virus, and worms. Plumbagin (5-hydroxy-2-methyl-1,4-naphthoquinone) is a quinoid constituent found in black walnut with neuroprotective, antimalarial, and anticancer properties. Other active constituents include myricetin, quercetin, kaempferol, taxifolin, beta-sitosterol, stigmasterol, 1-alpha-tetralone derivative, and (-)-regiolone. Black walnut is also a high source of polyphenols, antioxidants, and monounsaturated fatty acids. Melatonin and phytosterols are also present in these nuts. One ounce of black walnut also contains 2.8 grams (g) of carbs, 1.9 g of fiber, and 6.7 g of protein. And, from a mineral standpoint, it is very high in manganese, copper, phosphorus, and magnesium. It also contains calcium, iron, potassium, zinc, and selenium. From a vitamin perspective, these walnuts also contain vitamin A, vitamin C, vitamin E, vitamin K, vitamin B1, vitamin B2, vitamin B3, vitamin B5, vitamin B6, folate, choline, and betaine. The following is a comprehensive nutrition chart with information for 1 ounce of dried black walnut or 28 g of the medicinal nut. What are the health benefits of black walnut? Studies have focused on the polyphenols, quinones, flavonoids, and constituents found in the black walnut kernel, which are recognized for their anti-inflammatory, antioxidant, antineoplastic, neuroprotective, and anti-atherogenic properties. The tannins of black walnut contain astringent properties. As a result, black walnut can help treat poison ivy, tinea pedis, xerosis, psoriasis, acne, eczema, and viral warts. Black walnut health benefits also include protecting against cancer, improving heart health, expelling parasites, and fighting fungal and bacterial infections. The following is a brief description of black walnut’s key health benefits. Juglone is a key constituent in black walnut. It is so toxic toward insects that it is often used as a natural pesticide by organic gardeners. Studies have shown that black walnut can expel parasitic worms from the body. Research published in Australian Pharmacist in 2012 suggests that black walnut is effective against tapeworm, ringworm, thread or pinworm, and other intestinal parasites. So, it is not surprising that black walnut makes its way into various parasite cleanse formulas. Black walnut is considered an excellent source of the omega-3 fatty acid known as alpha-linolenic acid (ALA). Walnuts, in general, are part of the Mediterranean diet, which is linked to reducing the death rate from coronary artery disease. Epidemiological studies suggest that frequent walnut consumption may protect against coronary heart disease due to its effect on blood lipid profiles. Diets with walnuts have been found to reduce LDL (low-density lipoprotein) cholesterol. As a result, it can also reduce blood pressure, as well as the risk of atherosclerosis, coronary heart disease, stroke, and heart attack. For many years, the juice of unripe black walnut hulls has been a folk medicine treatment for fungal infections like ringworm. These fungal infections often involve keratinized tissues, including skin, nails, and hair. Research has compared the antifungal activity of juglone in black walnut with other antifungal agents, including tolnaftate, clotrimazole, griseofulvin, zinc undecylenate, triacetin, liriodenine, selenium sulfide, and liriodenine methionine. Studies have found that juglone exhibits moderate antifungal activity similar to commercially-available antifungal agents, selenium sulfide, and zinc undecylenate. Internally, black walnut is used for portal congestion, intestinal toxemia, chronic constipation, giardia, and hemorrhoids. Other derivatives of 1,4-naphthoquinones have exhibited strong antifungal and antibacterial activity. A series of 50 naphthoquinone derivatives were evaluated for antifungal and antibacterial properties with the highest activity against candida and Staphylococcus aureus symptoms. The quinones in black walnut also have an association with anticancer activity. The juglone, in particular, inhibits transcription of cancer cells. Studies have found that juglone promotes cell death in human colorectal cells. In China, the immature green black walnut fruit has been used to treat lung, liver, and gastric cancer. Furthermore, the plumbagin in black walnut also inhibits the ectopic growth of melanoma, human breast cancer, and non-small cell lung cancer cells. Plumbagin has also been reported to inhibit the growth of pancreatic and prostate cancer cells. Plumbagin is a powerful constituent in black walnut with antimalarial activity against a mosquito vector of malaria called Anopheles stephensi Liston (A. stephensi). A study published in Parasitology Research in 2014 discovered that after three hours of exposure, plumbagin produced larval death against A. stephensi. This suggests that plumbagin may be useful as a natural treatment for controlling malaria. For the most part, black walnuts can be purchased at stores or from a reputable online store, often under the Hammons label. You can often find black walnut at local farmer’s markets in states where they grow. Black walnuts can last up to a year in the refrigerator, or two years in the freezer. Black walnuts are considered smaller and harder to crack than English walnuts. Black walnuts are also much more difficult to pick from the shell than other walnuts. This is why black walnuts are chopped—they are considered a tough nut to crack. Aside from using a huller, people will also crack the shell with a rock or hammer. Once hulled, black walnuts are dried for a few weeks before being cracked. It is best to crack them when you hear nuts rattle when you shake the black walnut. Green hulls in black walnuts are considerably more effective than hulls with a darker color when harvested. You can take one to 10 drops of fresh black walnut liquid extract, one to three times daily in some water. Black walnuts are also delicious in cooking. You can crack open the nuts and use the meat for eating and cooking. You can also crush the hulls into a powder. Black walnuts can also be used in soups, baked into casseroles, or sprinkled on salads. Although there are major health benefits associated with black walnut, there are certain precautions to keep in mind. For instance, the tannins in them cause dehydration on the top layer of the skin, which can lead to calluses. For people with nut allergies, an allergic reaction to these walnuts may lead to itchy and swollen skin, chest pain, rashes, hives, or breathing difficulty. Fresh green black walnut husks can also cause irritation and blisters when excessively applied to the skin. It is also a sedative to the circulation system and heart when taken internally in high doses. It is also recommended to wait at least two hours before taking any medication, supplement, or any other herb after consumption. This is because black walnut may bind to other drugs when taking them at the same time. Black walnut may alter blood pressure medications. Black walnut may also have additive effects when taken with laxatives or antimicrobials. You should also avoid long-term use and be cautious when combining drugs, herbs, or supplements used for inflammation, nausea, cancer, and gastrointestinal issues, along with drugs, herbs, and supplements that harm the liver or kidney, or supplements and herbs with tannins. Breastfeeding or pregnant women should also avoid them. “Nuts, walnuts, black, dried Nutrition Facts & Calories,” SELF NutritionData; http://nutritiondata.self.com/facts/nut-and-seed-products/3137/2, last accessed August 2, 2017. 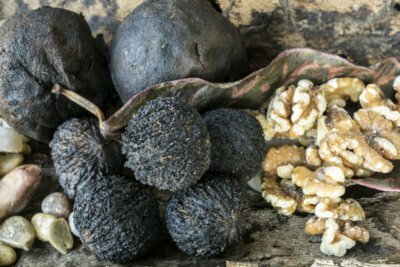 “7 Amazing Black Walnut Benefits,” Organic Facts; https://www.organicfacts.net/health-benefits/herbs-and-spices/black-walnut.html, last accessed August 2, 2017. “Black Walnut Hull Herb Profile,” Wellness Mama, April 13, 2017; https://wellnessmama.com/257/black-walnut-hull-herb-profile/. Group, E., “The Weight Loss Benefits of Black Walnut Hull,” Global Healing Center, August 8, 2014; https://www.globalhealingcenter.com/natural-health/weight-loss-benefits-black-walnut-hull/. Oates, L., “Complementary medicines for intestinal parasites,” Australian Pharmacist; 31(2): 132-135, ISSN: 0728-4632. Pradeepa, V., et al., “Antimalarial efficacy of dynamic compound of plaumbagin chemical constituent from Plumbago zeylanica Linn (Plumbaginaceae) against the malarial vector Anopheles stephensi Liston (Diptera: Culicidae),” Parasitology Research, August 2014; 13(8): 3105-3109, doi: 10.1007/s00436-014-4015-5. Hu, F.B., et al., “Frequent nut consumption and risk of coronary heart disease in women: prospective cohort study,” The BMJ, November 14, 1998; 317: 1341, doi: 10.1136/bmj.317.7169.1341. Strugstad, M.P., “A Summary of Extraction, Synthesis, Properties and Potential uses of Juglone: A Literature Review,” Journal of Ecosystems & Management; 13(3): 1-16; http://jem.forrex.org/index.php/jem/article/viewFile/119/473.